NEWARK, N.J. -- Consider it a wake-up call three weeks in the making. On the surface, the New York Rangers have been cruising along without a problem in the world. Entering Tuesday night's game against the New Jersey Devils, they were perched atop the League standings, looking down on an Eastern Conference they've controlled since January with a mix of hard work and smart play that led to 91 points with the playoffs still more than a month away. But below the surface, a storm has been brewing, and it finally knocked the Rangers off course. A lack of energy and a plethora of mistakes sealed the Rangers' fate in a 4-1 loss at Prudential Center, one that saw All-Star defenseman Dan Girardi virtually benched for the final 15 minutes of the third period after his turnover in the neutral zone led to the Devils' third goal of the contest. Afterward, the Rangers' locker room felt more like one occupied by players searching for answers to their poor play than one looking at the loss as a hiccup in an outstanding season. "We've played at a good level most of the year, and that's why we've been successful," said Brad Richards, one of the few veterans on a very young team. "Teams are going to keep picking it up as they get into races, and our desperation has to match those teams or be better. That's how you stay on top. That's how you become consistent. "We're not there right now." Since a 3-0 win in Boston on Feb. 14, a performance coach John Tortorella wasn't pleased about, saying goaltender Henrik Lundqvist and his 42 saves that night masked a lot of flaws, the Rangers are 5-3-2. That's the type of stretch that wouldn't have teams talking about a need for improvement, but Richards said the record doesn't indicate how the team has been playing lately. "We've won some games and got some points, but you don't know if you're playing well or not," Richards said. "We had to rely on Hank and Marty (Biron) at times, or had to rely on opportunistic goals, and sometimes you have to realize you're not rolling along playing perfect hockey. It's good that we were getting wins. But this might be a good wake-up. We realize we're not where we need to be or want to be." Richards talked about the Rangers not being "mean enough" of late, and Brian Boyle agreed with the assessment. "You've got to be (ticked) off. 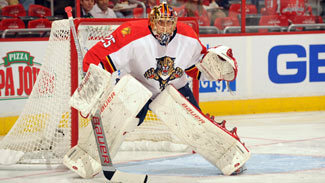 You've got to hate the other team," Boyle said. "You want to run right through them and you want to be dominant in that regard. You want to beat them physically. You want to beat them offensively, be better in all areas of the ice. When it's a physical game, it's going to get more physical and more intense. It's going to be a battle and a war. We have to have that mentality." What the Rangers lacked in fire, they made up for in costly gaffes. The Devils jumped to a 1-0 lead 49 seconds into the game when Ilya Kovalchuk beat Lundqvist on a breakaway. The play started in the neutral zone when Rangers star Marian Gaborik coughed up the puck while his team was trying to make a line change, giving Kovalchuk the space he needed to split the defense. The Rangers responded with an inspired second period, outshooting the Devils 14-7 and tying the game on Derek Stepan's 15th goal of the season. That effort didn't carry over into the third period. David Clarkson made it 2-1 at the 2:27 mark when a shot by Petr Sykora clipped his leg and got past Lundqvist. Just 1:44 later, Girardi's turnover just outside his own blue line led to a goal by Ryan Carter that made it 3-1. Following that goal, Girardi found himself glued to the bench for the final 15:39 of the third period except for a one-minute shift about seven minutes later. "We should know that by now. It's tough. Everybody's been guilty of it," Boyle said of the neutral-zone mistakes. "We need to just try to take care of the puck a little bit more. Guys are going to make mistakes and we know that. Nobody's pointing fingers in here. We're all looking in the mirror individually. You can't be satisfied. We haven't accomplished anything." "There were too many turnovers in the neutral zone," said Rangers captain Ryan Callahan, who said he felt no ill effects from a bruised foot that kept him out of the lineup for three games. "A couple of their goals, they countered from the neutral zone. That's why they do -- they clog the neutral zone up, grab the puck and they're right down your throat. That cost us tonight with a couple goals." The Rangers still hold an eight-point lead on the Pittsburgh Penguins for the top spot in the East. Both teams have 17 games left on the schedule, with a showdown looming next Thursday at Madison Square Garden. If the Rangers want to remain an elite team, they need to clean up their game, because as Lundqvist put it, they aren't good enough to win playing any other way. "We made some tough mistakes out there that cost us," Lundqvist said. "They're a skilled team. But it doesn't really matter who you play. The reason why we've been winning is because we haven't been making that many mistakes. We've been playing pretty tight hockey and smart hockey and working really hard, and if that's not there, I don't think we have the skill to beat teams. That's where it starts. We have to be a hard-working team and smart-working team. We just have to get back to that."